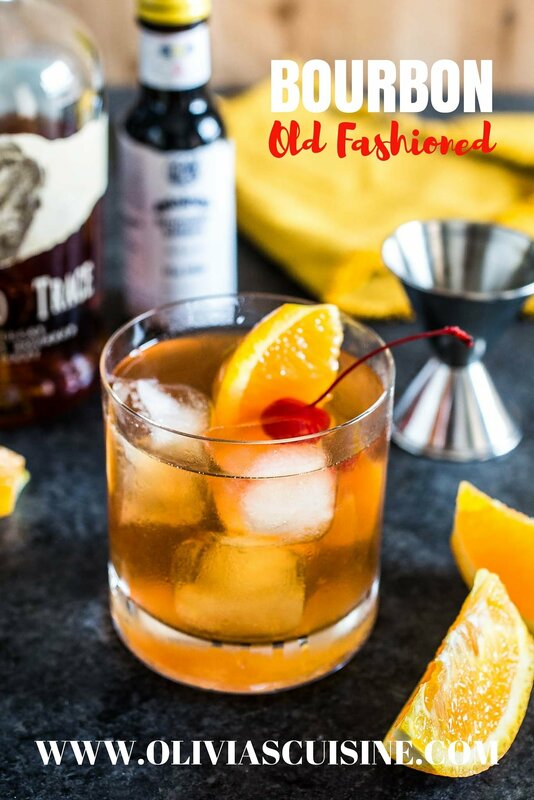 I can’t think of a better way to treat my dad for Father’s Day than by making him a classic Bourbon Old Fashioned. My dad is a big whiskey drinker, so I thought sharing a whiskey cocktail was fitting for the occasion. True, he mostly drinks scotch, but I’m sure he would love a Bourbon Old Fashioned as much as Don Draper does! I realized this is my second cocktail post this week. Well, it was meant to be, because I have some pretty amazing news that definitely deserves some boozy celebration. I finally quit my “survival job”! ??? Yep, I’ve done it. I am now a full time blogger and will be appearing here more consistently! I’m writing a separate, non-food related post to tell you all about it, so that’s all I’m sharing today. I know, I know, the nerve to make you wait! What can I say? I grew up watching soap operas! ? 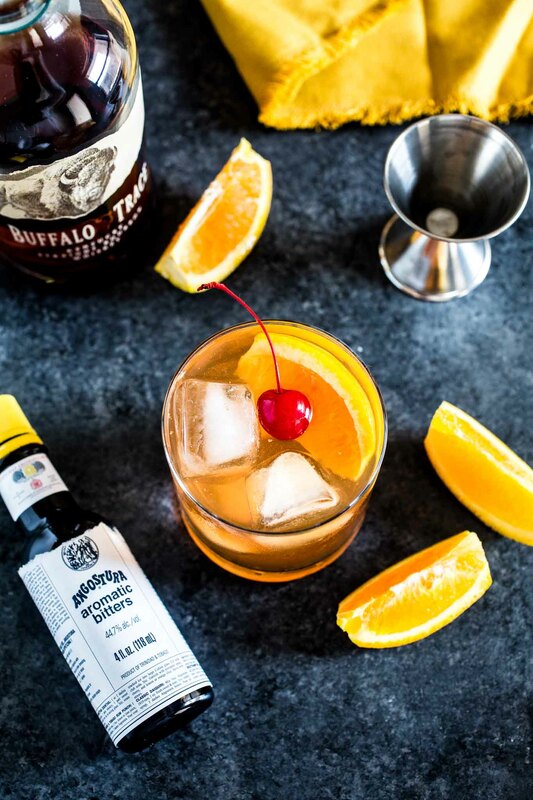 Besides, you can always make yourself a delicious Bourbon Old Fashioned to sip while you wait! ??? 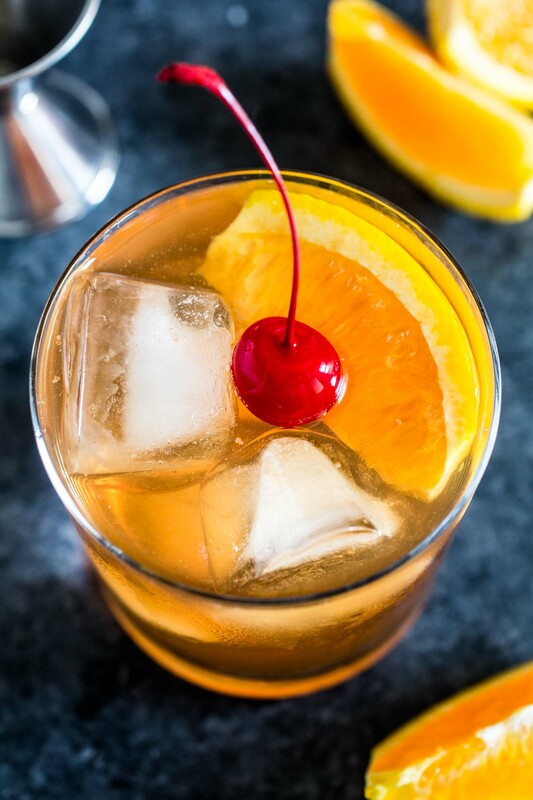 The Old Fashioned is an American Classic and one of the world’s finest cocktails. It is fairly simple to make and can be tailored to meet your personal preferences. It traditionally consists of whiskey (bourbon or rye), sugar or simple syrup, bitters, and ice. Sometimes a little water or club soda to help dilute the sugar before adding the liquor. I like using bourbon over rye, because bourbon is sweeter and smoother. Whichever you choose, you wanna use something high in proof (over 100) to stand up to the dilution from melting ice. To prevent your cocktail from becoming too watered down, avoid small cubes of ice. I use large cubes, but one of those fancy and cool spheres would be best! But I say: this is my food blog and I like to make things look nice for the pictures. ? A good cocktail should be a treat for the eyes, as well as the palate. If you’re an Old Fashioned snob (or are trying to impress one), feel free to skip the orange wedge and cherry and use lemon (and/or orange) peel instead. You can also rub the oils of the peel into the rim (and even the insides) of your glass. As for which kind of glass to use, the answer is: an Old Fashioned glass, of course! But, in a pinch, any short glass will do. There are a million ways to make an Old Fashioned. 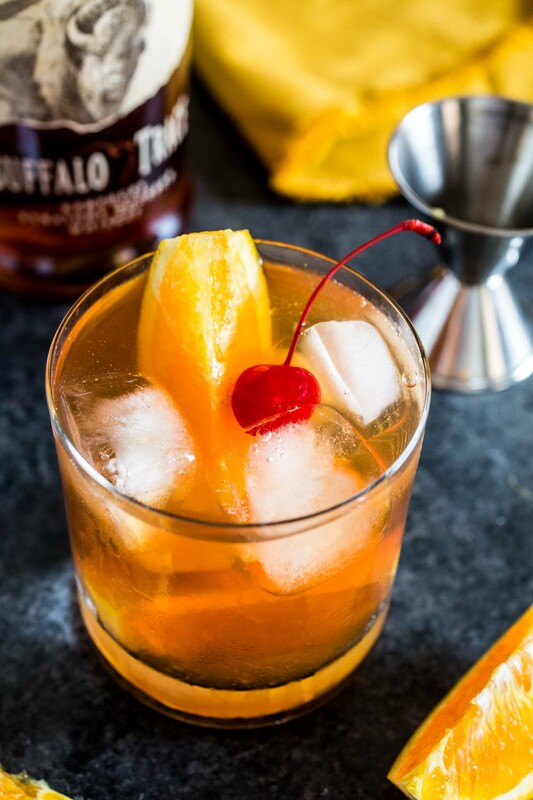 Some people say that the proper technique to make the perfect Bourbon Old Fashioned is to stir the cocktail with ice for 20 to 30 seconds and then strain it over fresh ice. I don’t do that! Mostly because I bartended for years and know that, unless someone has a sophisticated palate, they will likely complain that “they cannot taste the liquor”. So I hit them with a strong drink and let the cocktail balance itself with time, as the person sips and the ice melts. If I would be making it for myself though, I would probably stir longer and let it dilute further, because I don’t like the taste of strong liquor. My straight shot days are past behind me! I might even add a little Sprite, making it the Wisconsin way, which might make some people shiver, I know. Whenever I try something new, I make it as authentic as possible the first time, just to understand what it’s all about. And then I start tweaking to my liking, because I care way more for taste than authenticity! Who cares if someone says your Bourbon Old Fashioned is not authentic? Start by rubbing an orange peel on an Old Fashioned glass rim (and insides, for a stronger flavor). Place the sugar cube inside the glass and top it with a few dashes of bitters. Add a few large ice cubes (or one big ice sphere), pour in the bourbon and stir well. Garnish with an orange peel (or wedge) and a maraschino cherry. Serve immediately, with a stirring rod. Congrats on quitting your “survival job” and thanks for the great recipe. The old fashioned is quickly becoming my favorite drink. I also have a site, but I’ve not yet left the job. You’ll have my email address from this form submission. Please reach out to me as we may be able to help cross promote each others sites. Thanks for this recipe. I agree with your comment regarding purists. After years of drinking Perfect Manhattans, the Old Fashioned has become my new favorite.